Solid Rubber Tyre 14"x 3"
Heavy Duty C.I Bonded Wheel 14" X 3"
We are an emerging and professionally maintained Manufacturer, Supplier and Wholesaler firm serving the needs of Wheels and Tyres. Our products offerings are extensively praised for its excellent grip and extremely durable appearance. 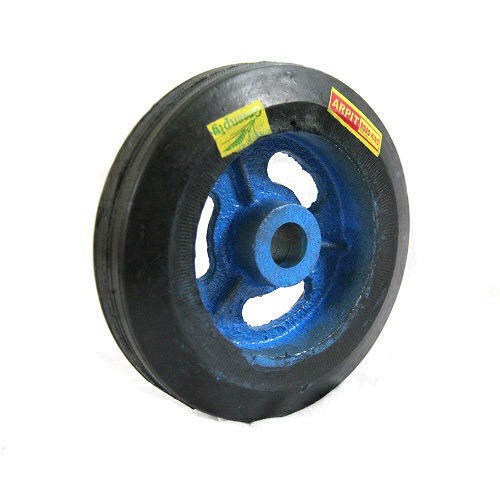 We, Anil Rubber Industries are manufacturer and suppliers of C.I Bonded Rubber wheel, Wheels for Hand Cart and Push Carts, Rim Type Trolley Wheel,Agricultural Tyres and Automotive Tyres, Generator Trolley Wheel, Solid Rubber Tyre, Wheelbarrow, ADV Tyres, Light Commercial Vehicle Tyres, Tractor Tyres, E-Rickshaw Tyres, Motorcycle Tyres, Scooter Tyres, Moped Tyres, Harrow Wheels, Auto Rickshaw Tyres, Traffic Barricade Wheels, Pumping Set Trolley Wheel.